HOME PRODUCTS &AMP; SERVICES DIRECTORY OF SUPPLIERS GROSCHOPP, INC.
Partnering with Groschopp means working with an small electric motor and gear motor manufacturer that strives for the American standard of quality. It means having a team of motor experts to find the best standard or custom solution for your application. It means 48-hour turnaround availability for small orders and samples. Bottom line: It means we want to help you become industry leaders in your own fields because your success is our success. Quality Product. Quality People. Quality Process. We know that many of our direct competitors also sell high quality products, but we provide a sense of pride and integrity to match our quality. You deserve a company that stands by their product, even if issues arise. We believe in treating you with respect, and working to address obstacles quickly and with you in mind. You should be able to count on your motor manufacturer holding its departments to a high standard of procedure. That is why we are ISO9001 accredited. All our departments operate under the same roof. This allows our engineering and sales departments to brainstorm ideas as a group. We believe having an inside sales team benefits you because we can bounce ideas around with each other and pull from different experience and expertise levels. Because we are a privately-owned company, there are less hoops to jump through when decisions need to be made. This means we are capable of shorter lead times and faster responses than many of our competitors. We have a fast-track department that is specifically designed to build and ship motors within 48 hours. 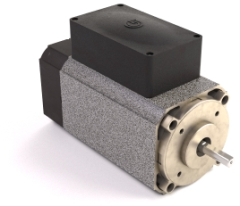 If you order in small quantities or are looking for sample motors, this option may be available to you. Our sales and engineering teams designed a sophisticated software to search through hundreds of thousands of motor and gearbox combinations. We take your specific environmental factors and duty cycle into consideration, ensuring you will get the best motor for your application. This is important because selecting the wrong motor can result in a more expensive motor than is needed or one with a shortened life expectancy. Ask us about testing your current gearmotor to determine the actual specifications your application requires. As time progresses, so do technology and industry standards. Don’t you want a partner who does the same? We believe in continually improving our craft and are consistently seeking ways to increase efficiency and performance of our electric motors. We partner with several organizations in the industry to continue learning. Many of our leaders volunteer their time at local high schools and colleges to inspire and encourage the next generation. We also believe in sharing our knowledge with you. Our desire to teach extends to our website; we offer several online resources including how-to videos, blogs and engineering tools for anyone who wants to learn more about motors and engineering. Look for your first issue of the Motors & Drives newsletter to arrive soon. View More Product Announcements from Groschopp, Inc.